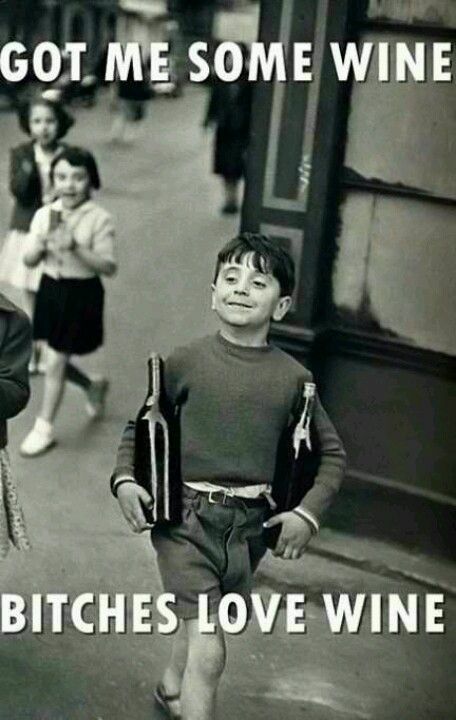 Wine is the oldest alcoholic drink in the book, and there’s a rich history to prove it. Dating back thousands of years, wine was commonly consumed by kings and queens in the mid-4th century. It dominates the gastronomic world as sommeliers create expert pairings for every dish imaginable. Sure, wine-making is, in many respects, a refined art form. 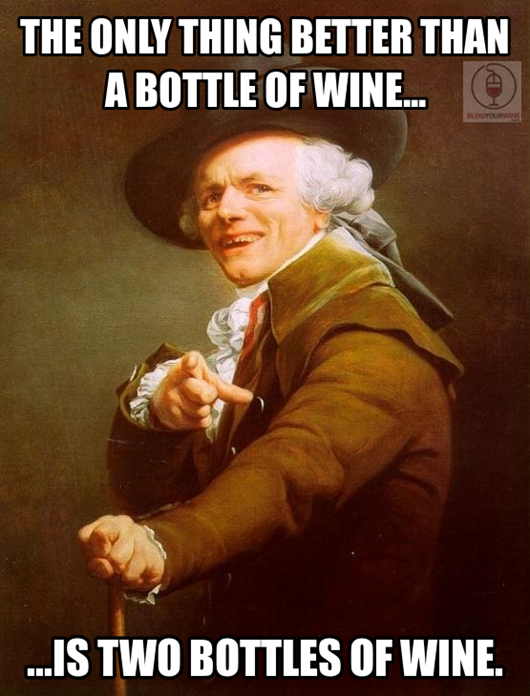 But in 2017, in the age of the internet, what could be more historically relevant or culturally valued than wine memes? It’s time we paid proper homage to the most cultured, acceptable form of excessive drinking. 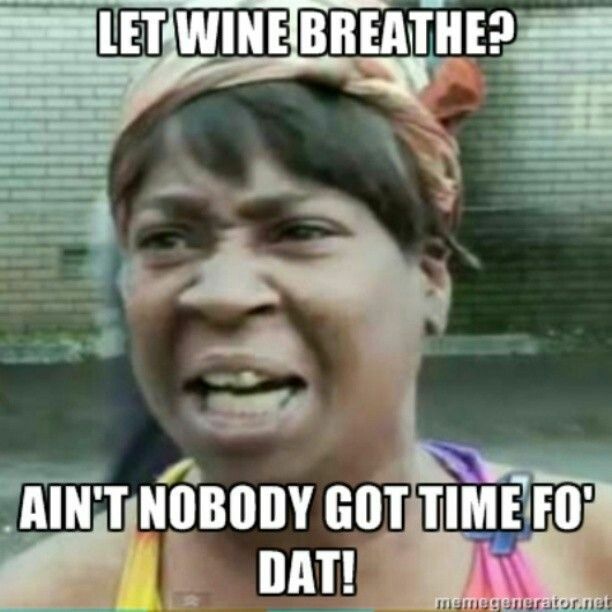 Here some of the best wine memes for true winos and enthusiasts to enjoy while sipping on your favorite pour—or any other time, really. There’s nothing better than the feeling you get walking down that glorious wine aisle, knowing you’re about to purchase a bottle or six of nature’s greatest miracle. Depending on how old you really are, this bright future may not be too far away. 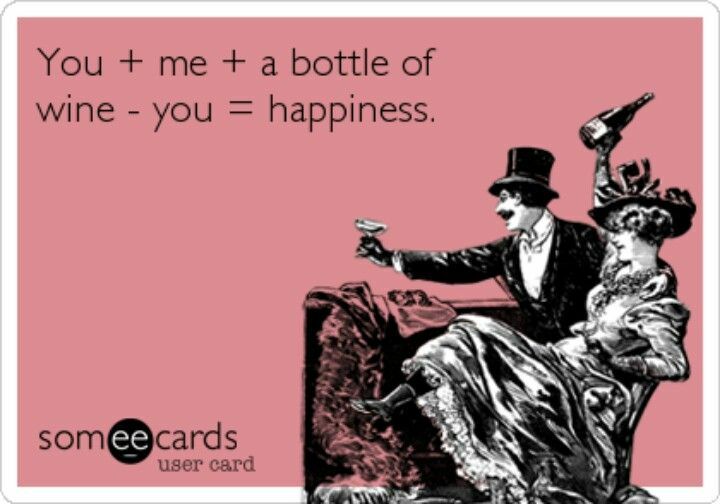 Let’s be honest here, why limit yourself to one bottle when you could have another to share with someone else? 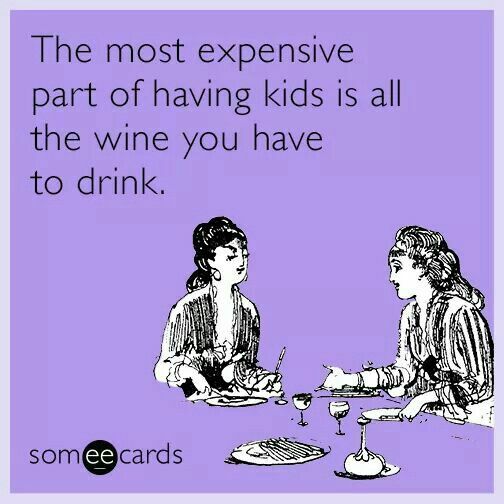 Besides, you get a discount when you buy six bottles at a time. What’s better than Netflix and chilling alone? Watching Netflix with a bottle of wine by your bedside. In defense of winos, a whole bottle of wine is equal to six glasses with a proper pour, which (with added food) is a perfectly reasonable amount at a dinner with friends. It’s science. If not already a regular part of your parenting routine, a glass or two after tucking the kids into bed at night is definitely well-deserved. Letting wine breathe, or aerate, after opening a bottle is a practice meant to “help soften flavors and release aromas.” If a red wine is young, it will most likely need at least an hour to breathe. A more mature, luxurious bottle is ready to be enjoyed right away. Or, you know, you can do whatever you want. When it comes to splitting a bottle of wine, things can get pretty awkward. What better way to avoid bottle-splitting headaches than by solo consumption? A little weird? Sure. But wine ice cream is probably one of the most innovative creations to date. 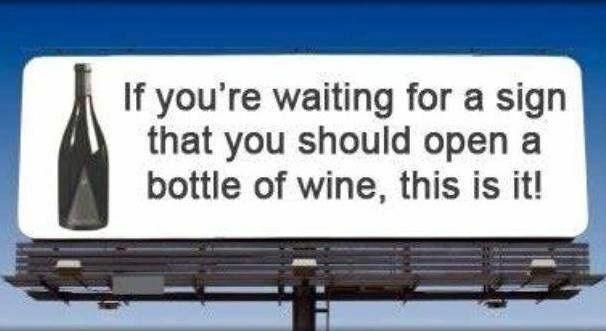 Wine lovers don’t need a sign to know it’s time to open a bottle of wine, but it doesn’t hurt. Whether you’re headed to a house party, a date, or casual hang with friends, being the one with a bottle in hand usually makes you a hero. Sometimes you just need a really, really big glass of wine after a long day. As it turns out, your real match is full-bodied and dry with notes of pepper. If you’ve ever made a trip to a winery, you know the wine-making process is a magical journey worth celebrating in itself. 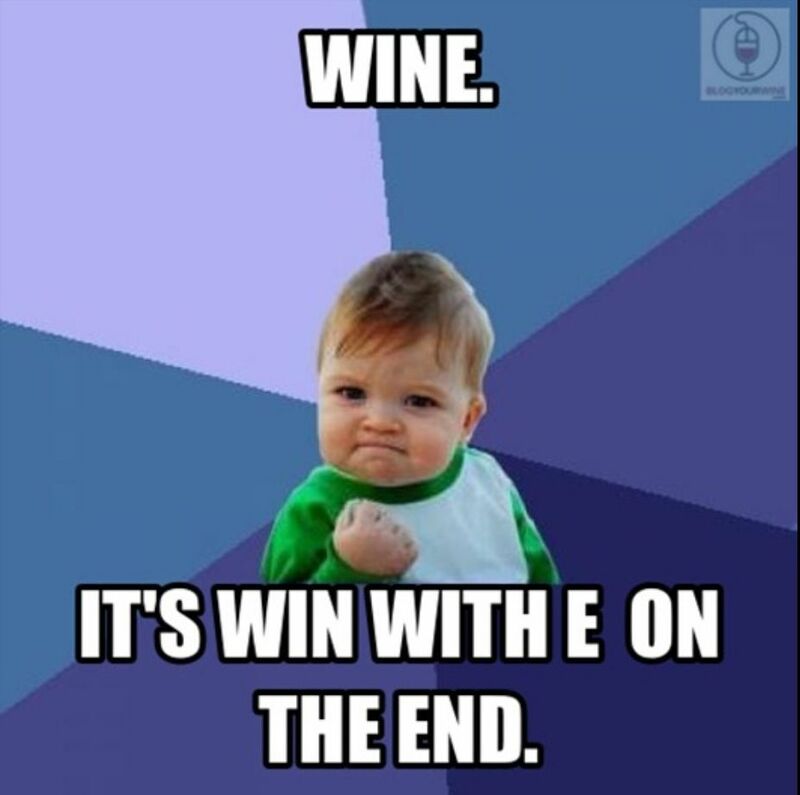 Congratulations, wine, we did it! 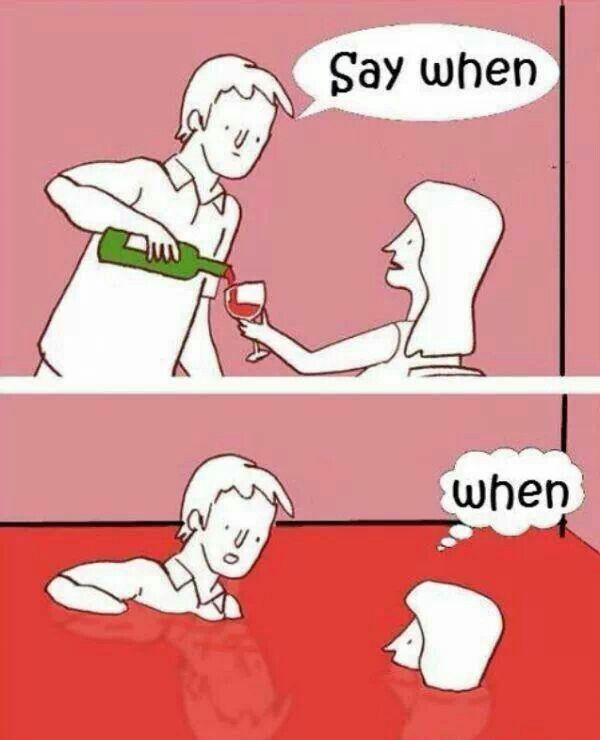 That moment when the waiter only refills your wine glass halfway will always be devastating. Anyone who actually drinks eight glasses of water or more each day needs to come forward and share their secrets with the world. Yes, girl, of course. Do not ask me this question ever again.